Our training program proudly uses force-free, fear-free scientifically-backed methods! Positive training treats the root of the problem, thus providing alternatives to unwanted behaviors. Positive training creates a positive association using rewards. Dogs repeat behaviors that are rewarded. Positive training gets dogs to think and problem-solve, which stimulates their brains, releasing calming hormones and reducing stress levels. Positive training is a great way to build trust and confidence for both dog and handler, and also provides a cooperative relationship with a willing partner. Positive training CANNOT create fear and anxiety. Positive training will help a fearful dog change his emotional response through rewards and creating positive associations. Positive training causes NO injury to dog or handler. Behaviors become stronger when random reinforcement is applied. Positive training works so well that zoos and aquariums all over are using positive training methods with their charges to facilitate day-to-day husbandry. It’s FUN for both dogs and handlers! A study published in the Journal of Applied Animal Behavior concluded that using confrontational methods, such as the “alpha roll”, hitting, yelling, punitive force, do little to correct a dogs’ behavior. Instead, using intimidation, force, and/or pain to elicit a behavior or decrease a behavior increases the likelihood that the dog will become fearful and defensive and may very well result in the dog biting the handler. Whether your dog needs training from the ground up, only needs some refreshers, or has a behavioral issue, we have programs to help. We will design a training program specifically for you and your dog. We will then teach you how to implement and maintain these methods on your own once the lessons are completed. Our comprehensive training methods will lay the foundation for clear communication and strengthening your relationship by building trust and confidence between both of you. Unleash your dog’s natural talents and see how rewarding training can be for both of you! Enhance your dog’s boarding experience with a customized training plan! Choose from an assortment of basic obedience cues* for our trainer to work on with your dog while he’s here. Our trainer will spend two half-hour sessions per day with your dog, focusing on teaching basic behaviors while providing an outlet to release stress and pent up energy. You will receive a detailed written training report with links to videos of your dog during training sessions. Looking to give your dog something fun, yet intelligent to do while he’s here with us? 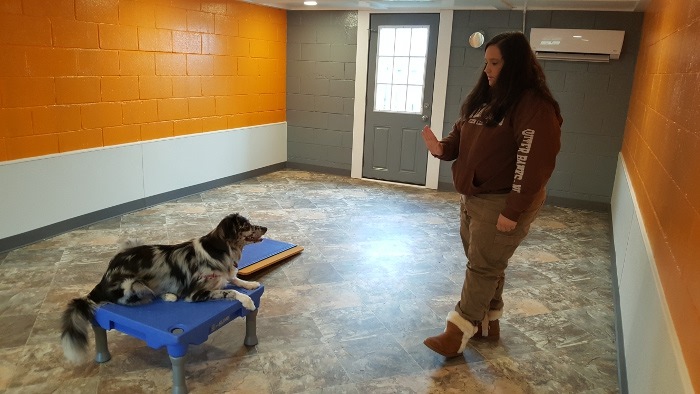 Our trainer will spend an hour with your dog working on confidence building and engaging your dog’s mind with fun exercises (interactive games, puzzles, shaping activities, etc.). Your dog will receive a thorough mental workout, which can be just as exhausting as physical exercise! Great for all dogs, even seniors. This class focuses on building confidence through fun and engaging core-strengthening exercises. As dogs age, their muscles begin to break down. Start with our Level I class and work up to our Level III class. Some of the things your dog will gain from Camp Fitness are increased strength, body awareness, confidence, improved balance, etc. Get your puppy started off on the right track with this 7-day puppy program. 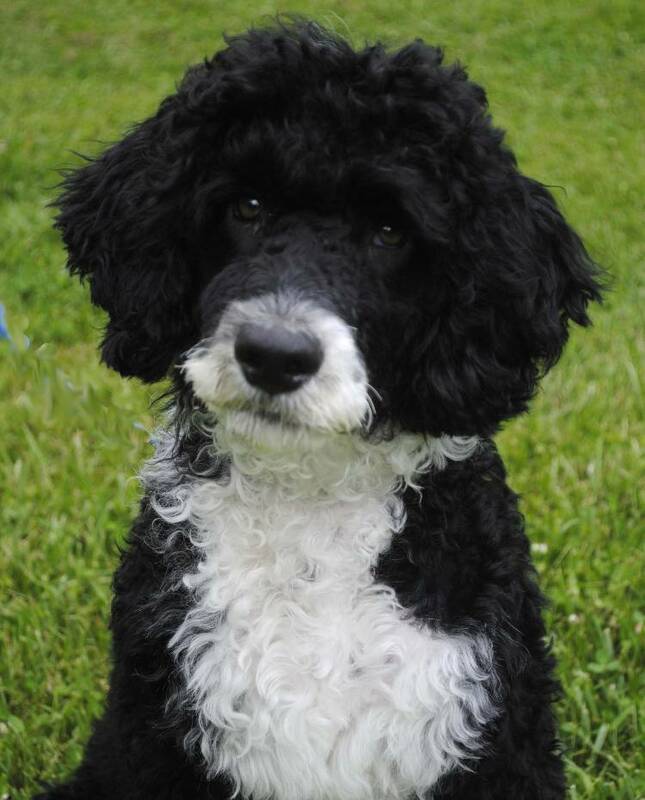 Our trainer will evaluate your puppy and tailor his training package specifically to him. For puppies four to six months of age. This is an intensive two-week training program specifically designed around your dog’s behavior and training needs. While your dog stays with us our trainer will be working with him every day teaching and reinforcing desired behaviors through positive reinforcement, reward-based training. Your dog won’t be bored with us! He will also have built into his intensive training sessions some fun, interactive, and confidence-building activities, which all leads to a well-rounded, well-behaved dog. At the end of the two weeks, you will receive a 60-minute transition session where you will learn how to take over as the primary trainer, thus providing continuity in desired behaviors and humane leadership for your dog. For dogs six months of age and up. Private training—at your place* or ours—is ideal for those who only want to work on a couple basic behaviors with their dogs. Our trainer works with you and your dog together to teach basic manners and behavior cues. You will learn how and why positive training is effective so that you can learn to train, prevent, and manage your dog’s behaviors. Each private lesson lasts 1 hour and will focus on 1-2 cues of your choice. 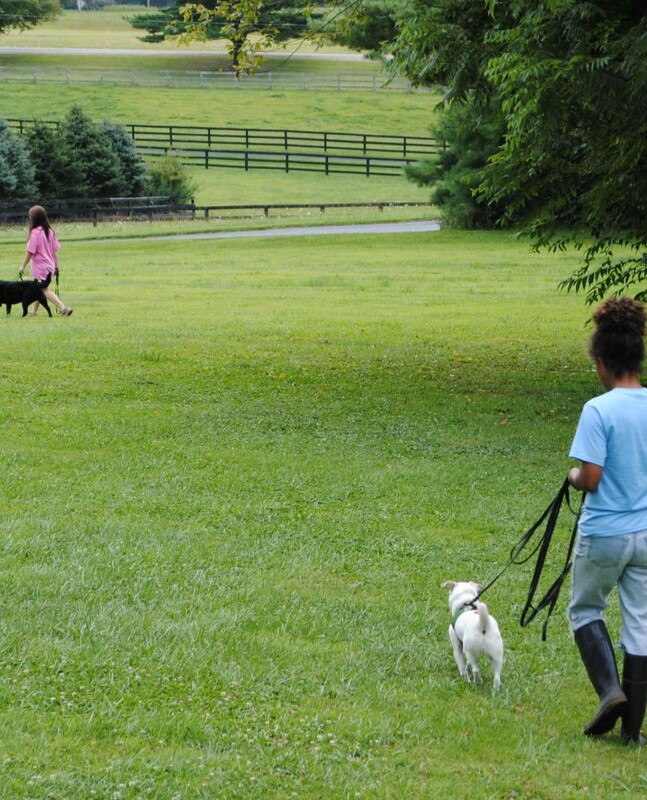 *Travel must be limited to 30 minutes from Shady Spring Pet Retreat for in-home private sessions.